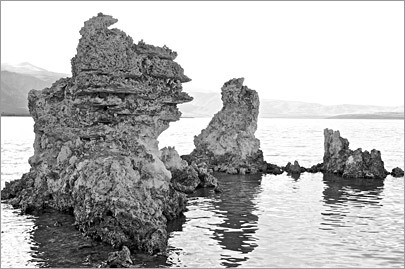 Art and Structure: Photography: "Three Tufa"
This photograph was captured with a Nikon digital camera and is developed on FujiCrystal archive paper. This is a true organic photographic developing process and therefore one print may vary ever so slightly from another. The finished photograph is sharper and displays greater detail than can be displayed on a typical computer monitor. All frame and mat assemblies meet museum grade archival standards. Photographs developed on FujiCrystal archive paper have been rated to last up to 60 years before noticeable fading under normal lighting conditions.